This is the second in a series of images from my recent trip to Buncrana, Co Donegal and again it’s from Ned’s Point this time looking south towards Buncrana. 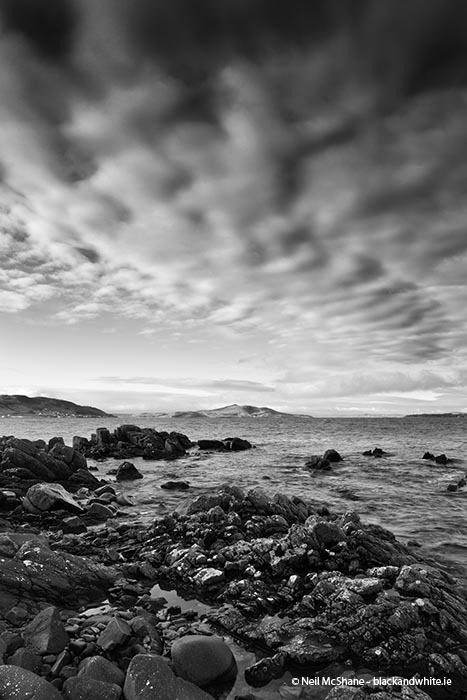 Buncrana Coastline from Ned’s Point, Co Donegal. It was taken on the same morning, about 20 mins after, the first Buncrana post. The sun had risen and starting to break up the clouds and they formed this wonderful pattern. I have two more to show you from this very productive morning shoot, luckily as it was the only time the weather behaved. The last one if from a beach just north of Ned’s Point along the coast path.